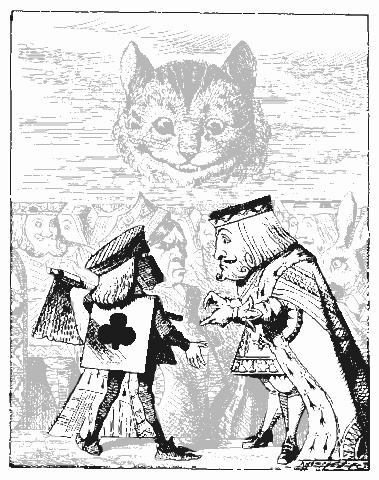 I love this picture from the book, Alice’s Adventures in Wonderland, where the Executioner and the King are arguing about whether they can cut off the Cheshire Cat’s head. And the cat is watching, thoroughly amused. Sometimes I feel like the Cheshire Cat. I’m amused when I read about or observe people who spend money on things they don’t need or on things they could buy or make for a lot less. They waste their money and then they complain about not having enough money! It’s enough to make me sit back and smile my Cheshire Cat grin. You don’t have to live your life according to what you see on TV or in the movies or in a magazine! You can live the life you want, the way you want to. As long as you aren’t hurting yourself or hurting others, you are free to live your life the way you want to (especially here in the United States and in many other democratic countries). You know what I think keeps people from living the way they want to live? They are so stuck in what they should be doing. What they should look like. What label should be on their clothes. What they should live in. What they should be eating. What they should be drinking. What school their kids should be attending. What lessons their kids should be taking after school. I say, F*CK THE SHOULDS! F*ck what other people think! Instead, focus more about what you think. What you feel inside every day. What you feel when you wake up in the morning and when you go to bed at night. Again, as long as you aren’t hurting yourself or hurting others, live your life the way you want to live it. For me, I love living frugally and knowing that my money is well spent, well managed, and that Marcus and I are taken care of in the present and in the future. Frugality is a value that I live by. Every time I find a better way to do something for less money (or no money! ), I feel like I am sticking it to The Man. And boy, is it a glorious feeling. For example, for the past year, I’ve been researching recipes for DIY health and beauty products. So far, I’ve made lip balm, hand lotion, face scrub, facial moisturizing oil, a solid deodorant for Marcus, a spray deodorant for myself, and scented bath salts. I know it may seem small, but every time I make a health or beauty product for mere pennies, and it works just as good as something I used to buy in a store, I get a boost. Do you want more freedom? Are you hung up on trying to please others? Are you trying to live up to other people’s images (or some brilliant marketing team’s idea) of what you should be or what you should be doing? It’s time to break out. One step at a time. Think of one thing that you can do this week to start living your life the way you want to live it. This entry was posted in Super Frug Basics by Peg. Bookmark the permalink.